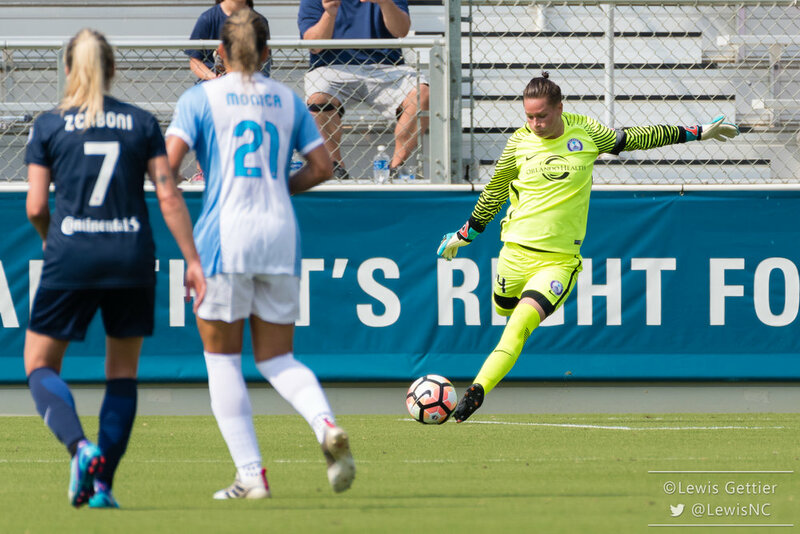 With Ashlyn Harris returning to Orlando’s lineup last Saturday, Aubrey Bledsoe’s run as the Pride’s starting goalkeeper is over. Bledsoe did well, compiling two clean sheets and a 1.36 GAA in 11 appearances, but Harris is an experienced international-caliber keeper who is also the captain of the team. Short of not giving up a goal at all, it was never likely Bledsoe would keep the job. However, two teams have made goalkeeper swaps this season. 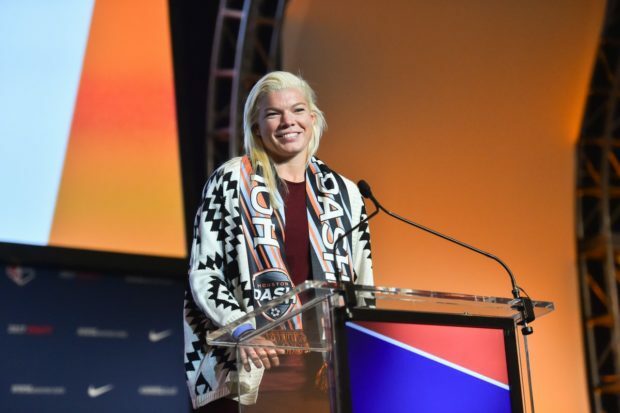 Eyebrows were raised when Houston drafted Jane Campbell this year, and likely none higher than those of Bianca Henninger, who was with Houston from the beginning, serving as backup to Erin McLeod and Lydia Williams. Ultimately Henninger was waived shortly before the season began. Williams held the starting job for the season opener, a 2-0 win over Chicago. Randy Waldrum bizarrely gave Campbell her first professional start the following week at Seattle, handicapping her by not only shaking up his defense at the same time but also playing her on the road at a team known to be dominant at home. The result was a 5-1 rout in which Campbell was dreadful, and she promptly returned to the bench. Fast forward a month when the Dash were embroiled in a six-game losing streak for the second season in a row. Waldrum was out, and assistant coach Omar Morales was in. After losing 2-4 at home to Orlando, Morales replaced Williams with Campbell in the next game, a rematch at Orlando. The Dash won 2-0, and Campbell has held the job ever since. The Dash were 2-6-0 with Williams (1.88 GAA) and are currently 4-3-2 with Campbell (1.22 GAA), which includes a six-game undefeated streak. Williams is the starting goalkeeper for a top 10 ranked national team, and there’s never been any doubt as to her quality. However, at times this season she appeared as affected by the losing streak doldrums as the rest of her teammates, and sometimes a team just needs a shakeup that has more to do with chemistry and morale than skill alone. I would also be remiss not to note that Campbell has benefited from a consistent backline in front of her rather than the rotating cast Williams had. However, Campbell, too, is a highly talented keeper who is cementing her spot in the USWNT pool. At the end of the day, you can’t argue with the results. NC Courage goalkeeper Sabrina D’Angelo (1) warms up before a match between the NC Courage and the Boston Breakers in Cary, NC in Week 9 of the 2017 NWSL season. Photo by Lewis Gettier. In last season’s NWSL final, Sabrina D’Angelo made 3 saves in the decisive penalty kick shootout and was named the championship MVP as Western New York raised the trophy. Now, she’s sitting on the bench. Following two straight losses in May, head coach Paul Riley swapped D’Angelo with Katelyn Rowland for one game (a 2-0 win against Sky Blue). He may have wanted to rest his starter after three games in ten days, or perhaps he just wanted to give his backup some game time (a novel idea in American goalkeeper SOP). D’Angelo returned for one game, a 2-3 loss at Chicago, before Rowland was given the nod once more in a 2-0 win over Kansas City. D’Angelo suffered an ankle sprain on international duty with Canada following that match, and Rowland has held the spot ever since. D’Angelo’s injury couldn’t have come at a worse time for her. Whereas Riley might have swapped a few more times otherwise, the extra games allowed Rowland to gain momentum and claim the starting spot for the rest of the season. It’s not as if D’Angelo is a poor goalkeeper; on the contrary, she posted a 1.43 GAA, three clean sheets, and a 4-3-0 record, helping North Carolina to the top of the standings. However, Rowland has more than risen to the occasion, with the best save percentage in the league at 88%, six clean sheets (second in the league by one), and an astonishing 0.40 GAA, while helping the Courage to an 8-2-0 record and maintaining their first place standing the majority of the time. To be fair, she has been behind what is statistically the best defense in the league, while D’Angelo had to deal with the shift between a three- and four-back formation, as well as the “Jess McDonald at right back” experiment. But as with Campbell, you cannot deny both momentum and results. The life of a backup goalkeeper is probably the most mentally difficult of any player on a pitch. They have to be ready at all times – just ask Caroline Stanley, brought in as an replacement for Bledsoe when she had a concussion, only to be unexpectedly called upon in the middle of a game at Seattle after Harris was injured, a 1-1 draw in which Stanley made two saves. Or Henninger, who in an ironic twist is back with the Dash as a backup while Williams is injured. Ask Sammy Jo Prudhomme, who set Boston’s record for consecutive minutes without a goal conceded while Abby Smith was injured but is back on the bench. Or Didi Haracic, who got her first ever start for the Washington Spirit last weekend in a 2-2 draw against Boston, likely giving Stephanie Labbé a rest after midweek games. But as Labbé herself can testify after returning from the Olympics last year only to have lost her starting spot to Kelsey Wys, whether backup or starter, game time is never a sure thing. An injury, or one rough game, and they could be watching the rest of the season from the bench. 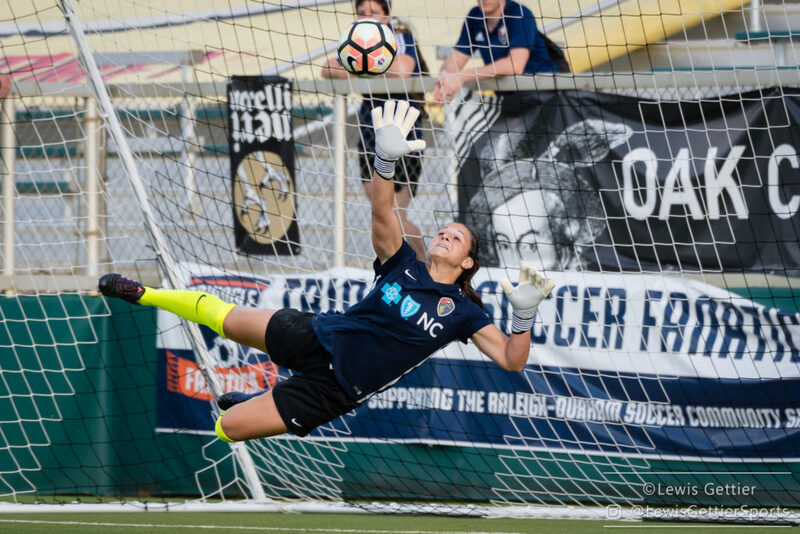 Goalkeeper talent in the NWSL has never been better, and that means the competition has never been fiercer.